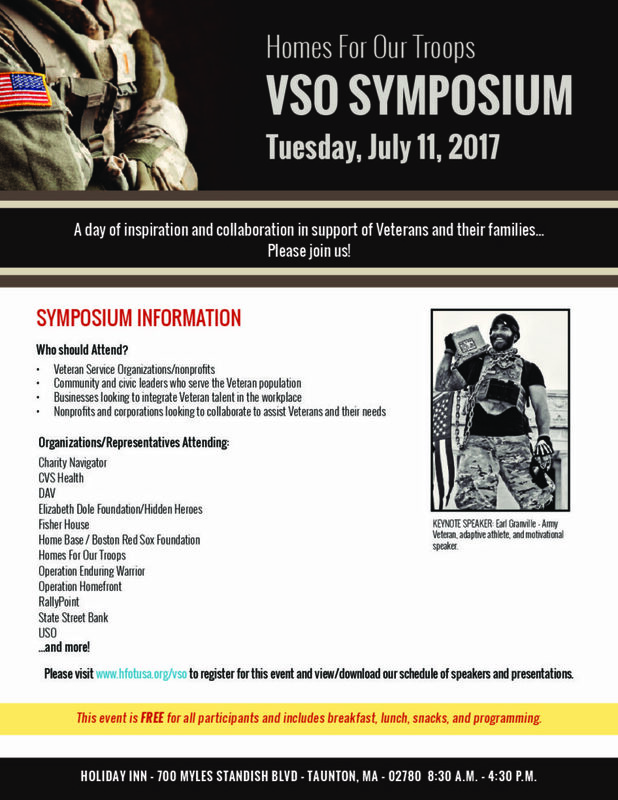 Thank you for attending the VSO Symposium on July 11. We hope you had a great day networking with colleagues from the various Veteran nonprofits and agencies in attendance. Be sure to give us your feedback about the event by filling out our survey or sending your comments to [email protected]. Click on the gallery below to view photos from the event. Visit this page often for updates from our collaborative partners and for resources & events that could help the Veterans and families in your program. 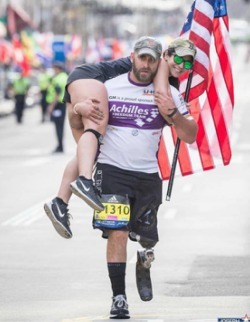 This past April, thousands of spectators and over 7 million Facebook users watched a man with a prosthetic leg pick up his guide runner and hoist her over his back as he crossed the finish line of the Boston Marathon. His name is Earl Granville, an Army Veteran who was wounded during his third deployment in Afghanistan in 2008. In the years following his recovery, Earl encountered many hardships, including the loss of his twin brother in 2010 by suicide. Turning to fitness, adaptive sports and various endurance challenges, he found the purpose, camaraderie and confidence akin to what he experienced as a Soldier. Eventually he discovered his gift of leading and helping others dealing with mental illness and depression, particularly those returning from combat. He now engages with thousands of audiences each year, often sharing the stage with “Cindy” a 40 lb cinder block wrapped in chains. Earl will share his inspiring story of perseverance and how he has learned to lean on the support of the Veteran nonprofit community, including HFOT, Operation Enduring Warrior, Achilles Freedom Team and others to help him “fight the good fight”. In the fall of 2016, The Elizabeth Dole Foundation (EDF) launched the Hidden Heroes Campaign, which works to bring vital attention to the untold stories of military caregivers and seeks solutions for the tremendous challenges and long-term needs they face. Joining us from this organization is Emery A. Popoloski, an EDF Fellows Program Coordinator and an alumni of the Fellows program who cares for her Army Veteran husband Charlie. Emery will discuss the mission of the Foundation as well as the Hidden Heroes Campaign. Emery will also introduce two other Dole Caregiver Fellows* and allow them to share their stories. *Jason Courneen – 2016 Massachusetts Dole Caregiver Fellow – Jason cares for his wife who was injured in the USCG in 1999. *Jillian Schuman – 2017 New Hampshire Dole Caregiver Fellow – Jill cares for her husband who is an injured post-9/11 Veteran. Home Base serves as a replicable model to promote the health and well-being of Veterans nationwide. Since its founding in 2009, Home Base, a partnership of the Red Sox Foundation and Massachusetts General Hospital, has been breaking new ground, leading regional and national efforts with a multi-disciplinary team of experts working together to help Post-9/11 Service Members, Veterans and their Families heal from the Invisible Wounds of War: traumatic brain injury (TBI), post-traumatic stress (PTS), military sexual trauma (MST), and other co-morbid conditions. Home Base Representatives will share the latest information about how they are working to ensure that Veterans and their Families receive or are connected to appropriate and uniquely-tailored care. They will also discuss their Warrior Health and Fitness Program, which currently operates in Boston, MA and in Southwest Florida, developed to help Post-9/11 Veterans maintain a healthy and physically fit lifestyle. In 2016, CVS health broadened their MinuteClinic services and piloted a first-of-its-kind partnership with the U.S. Department of Veterans Affairs to offer clinic services to Veterans served by the Palo Alto VA. The success of the pilot resulted in the recent expansion of the program to provide quality care to Veterans served by the Phoenix VA Health Care System. CVS Health’s commitment to help Veterans and their families doesn’t stop there. We’ll hear more about CVS Health’s focused workforce initiatives and team of colleagues dedicated to ensuring that youth, mature workers, Veterans, and individuals with disabilities have a place within the company. With over 43,000 Veteran and military related nonprofits operating nationwide, attracting and sustaining loyal supporters to your charitable cause each year becomes increasingly difficult. Building trust and confidence with donors through transparency and accountability is key to your organization’s long-term success. Shannon McCracken, Chief Development Officer at Charity Navigator will explain the importance of charity ratings in the giving community and ways your organization can improve its rating. We’ll also take a look at some of the ways nonprofit leaders can work together to make a greater impact and improve efficiencies throughout the VSO community. In short, how can we better serve the Veterans in each of our programs, and how can we do this together? An open forum to share your best practices, (communication tools such as newsletters, press kits, annual reports, impact reports etc.) ask questions, and tackle your toughest on-the-job challenges! Since 1920, DAV (Disabled American Veterans) has been dedicated to a single purpose: empowering veterans to lead high-quality lives with respect and dignity. DAV helps Veterans, their families and survivors access the full range of benefits available to them; fights for the interests of America’s injured heroes on Capitol Hill; connects Veterans with meaningful employment; and educates the public about the sacrifices and needs of Veterans transitioning back to civilian life. DAV National Commander Dave Riley*, a quadruple amputee who served in the Army and Coast Guard, will discuss DAV’s mission, current initiatives and ways Veterans advocates can work together to ensure our promises are kept to the men and women who’ve served. * Dave Riley — DAV National Commander — Dave was elected unanimously to lead the 1.3-million member DAV. 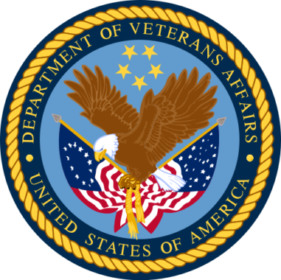 David Hencke, U.S. Department of Veterans Affairs Veterans Outreach Coordinator, will speak to the VA’s efforts to empower local communities and non-profits. In particular, we’ll hear about their Regional Veterans Council and its “One Team! One Fight!” approach to comprehensive Veterans care. 2. How likely is it that you would recommend the event to a colleague? 3. How likely are you to attend a similar event in the future? 4. With what frequency would you like to attend this event? 5. What was the most valuable thing you learned today? 6. What was the least valuable aspect of today’s meeting? 7. How will the Symposium impact your work with/support of the military and veteran population? 8. Any suggestions for future speakers or topics? 10. How did you learn about the Symposium? The VSO Symposium is free for all participants and includes breakfast, lunch, snacks, and programming.